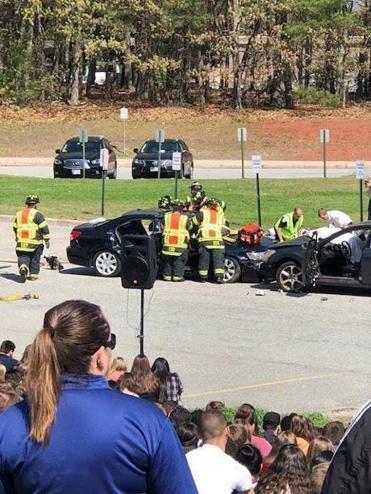 Chelmsford police organized a mock fatal car crash scene to illustrate the danger of drinking and driving for juniors and seniors at Chelmsford High School. Thursday’s event was planned just in time for prom season and summer when authorities often see a spike in rates of underage students driving under the influence. “This event is something we do every year because it carries a lesson that never loses its importance,” Chelmsford Police Chief James Spinney said in a statement. Police set up two cars to look like they had crashed head-on. Student actors played the drivers and passengers. One student was cast as a victim, police said. Students looked on as Chelmsford officers rushed to the aid of those injured, and pronounced the “victim” dead at the scene. Police found several beer bottles in a car and determined that the “driver” was under the influence, the statement said. When the pretending was over, the students listened to the real-life story of a fatal car crash. Matthew Clarke of Arlington told of the night he drove drunk in 2007, when he was 18. His friend, a passenger in his car, was killed. “We want young drivers to recognize the very real, and often deadly consequences that come with making the decision to drink and drive,” Spinney said.